The Director of "You wanted the best, you got the best" Kiss documentary. Kiss Army Argentina interview with Alan G.Parker: "We are here to celebrate KISS not to start World War 3"
KISS Army Argentina: KISS fans all over the planet are eager to watch the new official film of the Band in which you are working. Can you please tell us about the current state of production and filming of “You wanted the best, you got the best”? KISS Army Argentina: How did the idea of making the movie happen? How was that first contact with Gene Simmons and Paul Stanley? KISS Army Argentina: Can you please tell us more about what we will see in “You wanted the best, you got the best”? Will it be a documentary on the history of the Band with interviews to their members, former members and related people? Will there be any dramatized fragments? KISS Army Argentina: How did Gene Simmons and Paul Stanley get involved in the movie? How much freedom did they give you to give shape to the movie? KISS Army Argentina: We also know that neither Ace Frehley nor Peter Criss have accepted to participate, and that is unfortunate, since “You wanted the best, you got the best” tells the story of the band that they themselves helped to create together with Gene and Paul. Who contacted Ace and Peter and why did the different parties involved not reach an agreement? KISS Army Argentina: Given this regrettable situation, Tommy Thayer, current “Spaceman” in KISS, came to save the day and contributed with interview material of Ace and Peter that he himself had helped to carry out for a KISS documentary that was never finished. Is this so?Please give us more details on this issue. KISS Army Argentina: What other KISS friends and personalities will participate in the film? Will it focus on the early years of the band only or will it cover their 40-year career? Will Bruce Kulick, Vinnie Vincent and Eric Carr’s relatives take part in it? KISS Army Argentina: Being aware of the different points of view on the history of KISS, we know that Gene and Paul have one version of the story while Ace and Peter (in spite of not taking part in the film) have another. How do you manage to reconcile those different positions while remaining unbiased and not getting complicated? 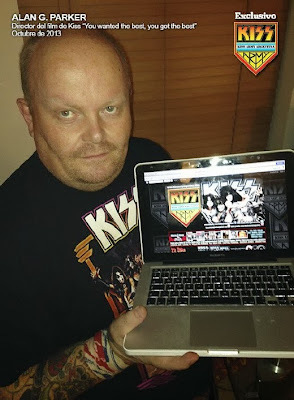 KISS Army Argentina: Will “You wanted the best, you got the best” be the best KISS documentary ever? As director of the film, how would you convince us to go to a movie theater when the film is released? Why should we do so? KISS Army Argentina: How much material have you watched and selected for the movie? Which thing surprised you and which moments would you mention as your favorites? What eras could be developed more extensively? KISS Army Argentina: Are you a KISS fan? And if you are, how did that impact on the work you are doing with the movie? KISS Army Argentina: When will the movie be finished? When will it arrive to movie theaters? KISS Army Argentina: How do you plan to promote the film? Are there any plans for taking it to festivals? KISS Army Argentina: What are your expectations as the director of the movie? What is so far the best part of working on this project? KISS Army Argentina: What else can you tell us about the movie that has not been said yet? KISS Army Argentina: Alan, once again, thanks a lot for your time. We wish you all the best with this movie, and we hope to see you soon in Argentina. It has been an honor. Thanks!